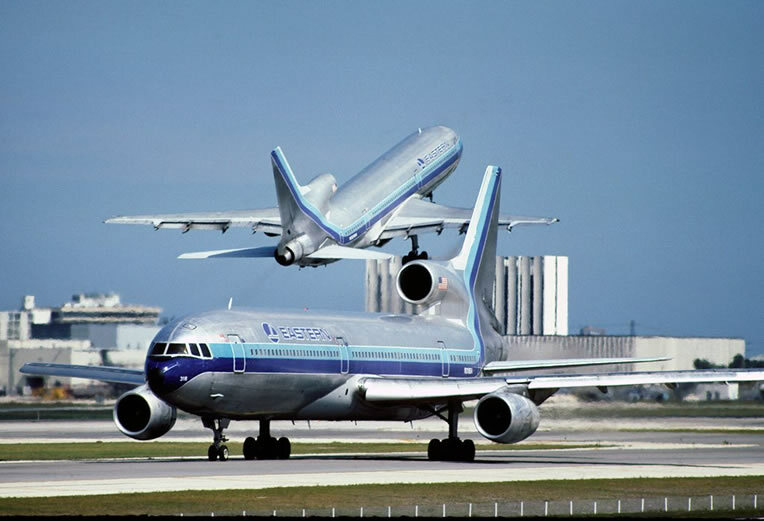 Anyone who knows me knows that I love three-holers, that is to say I love the Boeing 727, McDonnell Douglas DC-10 and MD-11 and of course the Lockheed L-1011. As a native New Yorker, growing up next to JFK International Airport and a few miles from LaGuardia Airport, I grew up not only watching three-holers of every variety fly bye, but I also flying the “shuttle” carriers from LaGuardia, which leads to a trivial piece of marketing that has always driven me nuts. When the Trump Shuttle took over the Eastern Air Lines Shuttle, on the 23rd of June 1989, flying the hourly service between LaGuardia and Boston’s Logan International Airport and Washington’s National Airport, the airline assumed a fleet of former Eastern Boeing 727-200 aircraft. Through the Trump Shuttle’s short lived existence, battling the Pan Am Shuttle, before becoming the USAir Shuttle on the 12th of April 1992, the airline only flew Boeing 727s (as did the Pan Am Shuttle) … so why is it the Trump Shuttle baggage identification tags depicted a Lockheed L-1011, in what appears to be an Eastern Air Lines livery? Sure there are bigger things in this world to contemplate, especially given that Eastern Air Lines is gone, the Trump Shuttle was barely alive even while it was in existence, the USAIr Shuttle is now a regular US Airways flight, Pan Am is gone (their Shuttle is now operated as the Delta Air Lines Shuttle) and no passenger airlines in North America fly either the 727 or L-1011 any longer … but this has always niggled at me. Is there an answer to this question? Probably not but I figured I’d share this with you all anyway. Below is a photo of a Trump Shuttle baggage identification tag, with the L-1011 image on it, as well an image of a Trump Shuttle safety card and a photo post card that used to be available on board Trump Shuttle Flights. It is time to let other concerns fill your mind. I don’t know much about the livery, but that sure looks like a B727 to me. Look at the all red luggage tag, not the safety card or post card image … the top image. That aircraft is without a doubt an L-1011. I don’t know how you can call the image on the baggage tag an L-1011. The L-1011 had the rear horizontal stabilizer located at the end of the fuselage whereas the horizontal stabilizer on the 727 was located high on the tail fin (vertical stabilizer) which is just what the drawing shows and it’s correctly labeled as a 727. The nose is a bit less pointy to be sure bit otherwise it clearly depicts a 727. Scoll up, look at the all red-&-white tag that read “Trump Shuttle” not the 727 safety card. The image on the red-&-white bag tag is an L-1011. the ‘trump shuttle’ bag tag is simply a reprint of the old EASTERN AIR LINES bag tags. instead of EASTERN, TRUMP SHUTTLE was printed on the tag. look carefully at the L-1011 on the tag. it clearly shows the old EAL fuselage strip. I was Marketing Director for The Trump Shuttle. The bag tag with the EA L1011 is not real. That is Eastern Airlines art work, which we never used.